Sandalwood essential oil is said to have been used for over 4000 years as a perfume and temple incense. It is uplifting and relaxing and is beneficial for all types of skin. Sandalwood has traditionally been burnt as an aid to meditation and much used in religious ceremonies. Sandalwood essential oil creates an exotic, sensual atmosphere with a reputation as an aphrodisiac. It's an excellent skincare oil, and is useful for dry and damaged hair and makes a wonderful body fragrance. 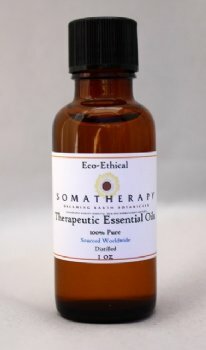 This Sandalwood oil from Indonesia is exceptional: soft, buttery, warm and very similar to the renowned Indian Sandalwood (which we no longer carry). Traditional uses include: antiseptic, emollient, soothing agent, astringent, and skin conditioner. Review: I am in love with this oil. I like the Australian Sandalwood too but this is definitely more smooth and luxurious. So happy to have found it!